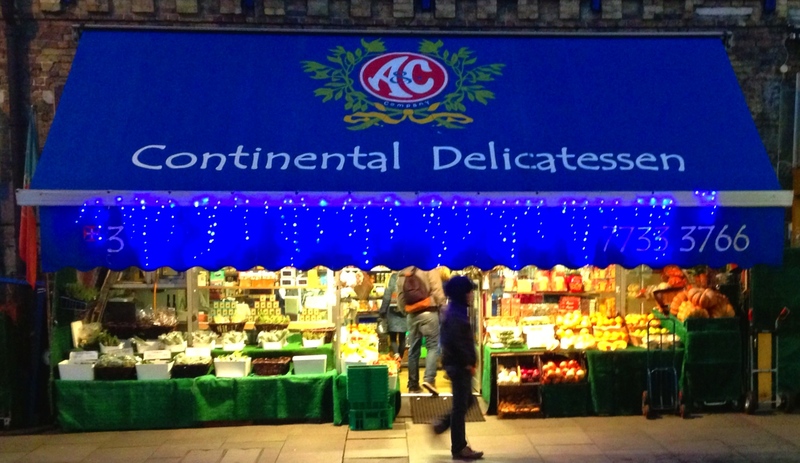 A&C Continental Delicatessen is the best food shop in Brixton. It’s also, incidentally, the friendliest. It’s been around for twenty years or more and runs the risk of being taken for granted. But it’s a gem of a place and can easily withstand any competition from the newcomers now coming to Brixton. I’ve always assumed the people who run the shop are from Portugal but the stuff they stock ranges across the whole of southern Europe. On the outside, to the left of the door, there’s baskets and baskets of really fresh herbs. To the right there’s other fresh fruit and vegetables, which tends to better quality than you get from other Brixton shops. This includes less common items like Padrón peppers (perfect fried with lots of rock salt), Jerusalem artichokes and quince. Inside it’s relatively small and often crowded. But everything you might expect from a good delicatessen is there and more. One great feature is easily the best selection of olives in Brixton. While it has to be admitted that the selection of salamis and cheese is relatively limited, I’ve never found this a problem because what they have is great. I’m particularly fond of the marinated feta, which is perfect in a greek salad, and the roquefort. Another regular purchase is the fresh chorizo, dulce and picante. If you’ve got really sweet tooth you have to try the Portuguese custard tarts or the apollinos, which are crunchy pastries filled with a sweet cream in flavours such as vanilla, pistachio, lemon, etc. So the question is what to cook. It’s worth mentioning Miss South of North South Food, who has blogged a recipe for apple and quince cobbler using their quinces. 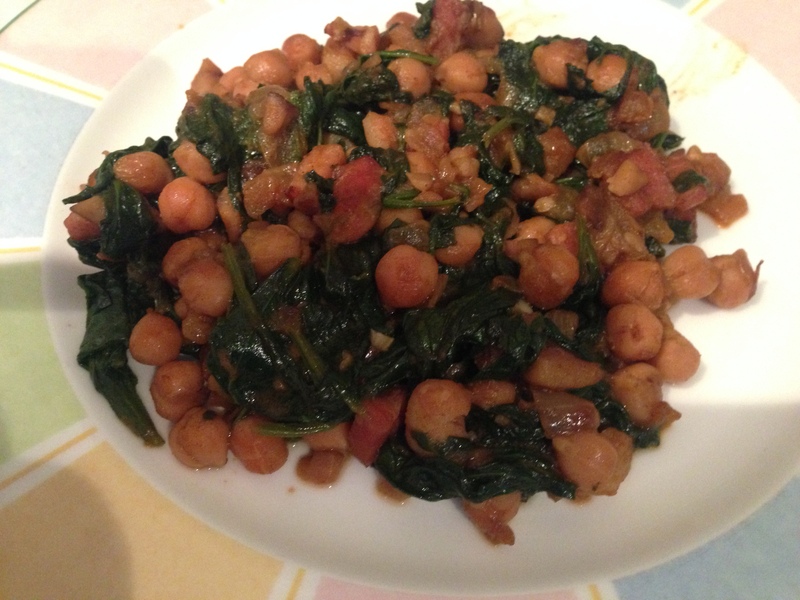 But I’ve gone for chickpeas and spinach, based on a Thomasina Miers recipe from her Channel 4 programme, A Cook’s Tour of Spain – see here for the original. Although they are not mentioned in the title of the dish, it’s the chestnuts that make this quick and simple fare into something that is so satisfying. You fry the onion and pancetta with the pimenton until the onion begins to soften; and then add the carrot, celery, thyme and bay leaves and cook for another 4 – 5 minutes, stirring occasionally. You then add the garlic and chestnuts and continue cooking until the vegetables become golden and the bacon is crisp. Now you add the chickpeas with 150ml of water and cook until they are hot. Finally, season to taste and add the spinach and stir until it starts to wilt. Serve immediately, garnished with the chopped parsley.